Quick Disconnect Air Distribution System for the Felder Format Sliding Table. 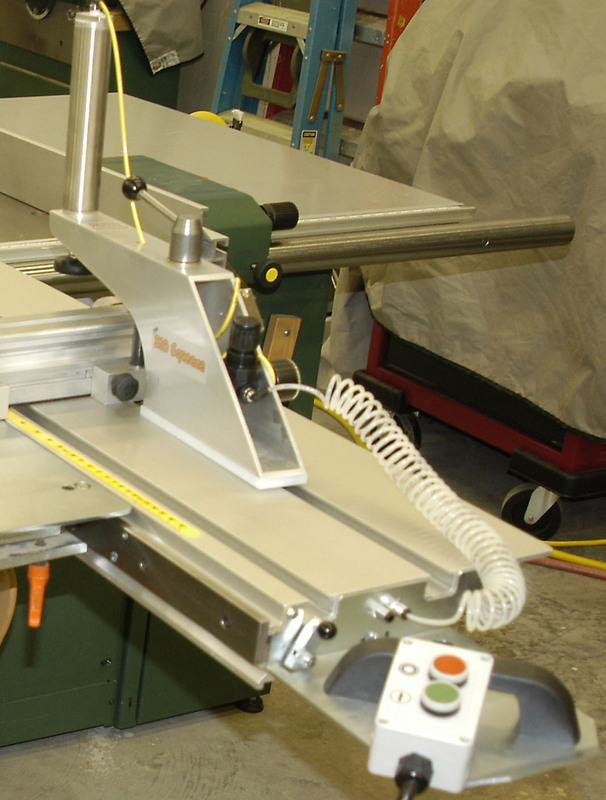 This document describes an air distribution system for the Felder format sliding table. 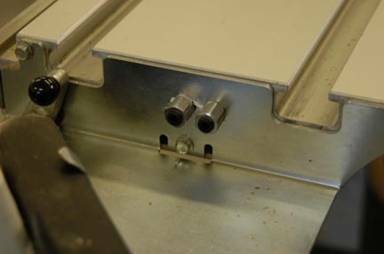 It provides self-sealing, quick disconnect fittings at both ends of the sliding table for connection to the Big Squeeze air clamps. 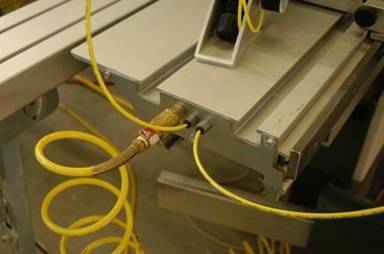 It facilitates quick connection and disconnection of the Big Squeeze air clamps to an air source distributed within the sliding table. The self-sealing nature of the quick-disconnect fittings allows the user to remove the Big Squeeze from the sliding table and disconnect it from the air source without having to first shut off the air supply coming into the sliding table. My thanks to Brian Lamb for his assistance in the design. This is the supply side. The coiled ¼” supply hose connects to a standard ¼” male quick disconnect air fitting mounted to the flange plate at the end of the slider. This is the same 1/4" Male QC fitting you would find on most handheld air tools in your shop. 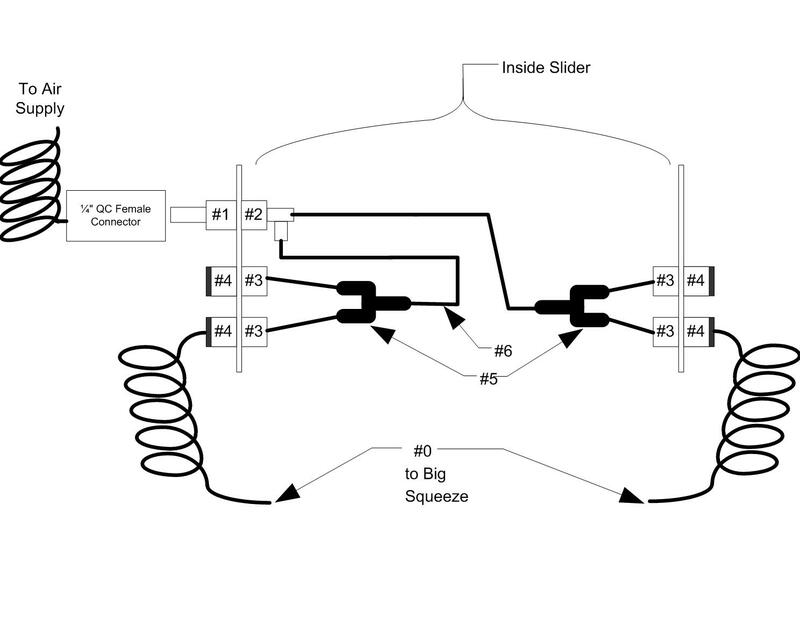 Inside the slider are a series of Y fittings and tubing that distribute the air to the 5/32" self-sealing quick disconnect fittings as shown in the diagram below. The small 5/32" fittings are quick disconnect and also self sealing. So, when you pull out the 5/32” tubing, the QC fitting seals off. To disconnect the tubing, you press in on the black flange and pull on the tubing. There are QC two outlets at each end of the sliding table. To get the air to the Big Squeeze, I have switched from straight 5/32” tubing to a coiled 5/32” tubing. This keeps the clutter at a minimum and reduces the chance the tubing will end up in the saw blade path. Here is what this coiled tubing looks like in operation. Below is the connection diagram showing number-keyed parts for each component. This is NOT the measured shop drawing that Norm talks about all the time. However, in conjunction with the parts list below, it should be sufficient for you to build your own version. Now let's talk about shop safety . . .
Below is the listing of the parts required to build your own version of this air distribution system showing the supplier, quantity required and cost of each component.. See diagram above for item # identifier.